The study showed that as TDP-43 accumulates in the brain of patients with FTLD, it ropes in DISC1, an important protein in the pathology of many mental conditions. Japan’s new study reports that dementia-related and psychiatric-related proteins cluster together to form aggregates in the brain, leading to abnormal cell function and behavior. Aggregation of the protein TDP-43 is a hallmark of a pathological process that leads to dementia called frontotemporal lobar degeneration (FTLD). The study showed that as TDP-43 accumulates in the brain of patients with FTLD, it ropes in DISC1, an important protein in the pathology of many mental conditions. The findings provide a clue to the unsolved puzzle of why psychiatric disorders often emerge in neurodegenerative disorders. "From the clinical point of view, it is critical to understand the molecular mechanisms underlying psychiatric symptoms in neurodegenerative diseases," said senior author Motomasa Tanaka, PhD, of RIKEN Brain Science Institute, Japan. The findings reveal that the TDP-43/DISC1 protein clusters disrupt the production of new proteins in neurons, a process critical for higher brain functions that are impaired in psychiatric disorders. First author Ryo Endo, PhD, and colleagues found the co-aggregates in postmortem brain tissue from patients with FTLD and in a mouse model of FTLD. The FTLD model mice were hyperactive and displayed abnormal social interactions, behaviors relevant to multiple psychiatric conditions. Aggregation of the protein renders it unusable, so Dr. Endo and colleagues added DISC1 back into the mice. The behavioral abnormalities in the mice returned to normal. "At the mechanistic level, TDP-43 and DISC1 co-aggregation disrupted activity-dependent local translation in dendrites," said Dr. Tanaka, a process that builds proteins from DNA codes based on neural activity. The disruption in translation resulted in reduced synaptic protein expression in the mice. Adding DISC1 back in also restored the reduced protein levels. The findings demonstrate that the co-aggregation of DISC1 caused the abnormalities in the model mice, suggesting that the co-aggregation of DISC1 with TDP-43 may disrupt cellular function and trigger psychiatric manifestations. "DISC1 has long been a focus of research as a consequence of its implication in the heritable risk for schizophrenia," said John Krystal, MD, Editor of Biological Psychiatry. "However, this new study implicates DISC1 in the biology of FTLD. There are still unanswered questions about whether DISC1 is disrupted in association with schizophrenia risk. However, the new study by Dr. Endo and colleagues provides a compelling case for further exploring the role of this protein in frontotemporal dementia," he added. 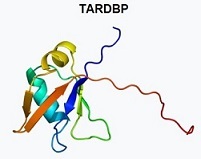 Illustration: TAR DNA-binding protein 43 (TDP-43). Wikipedia.